Continuing a trend seen for the past five to six years, annual rent growth in metro Newark-Jersey City is running below the national norm. 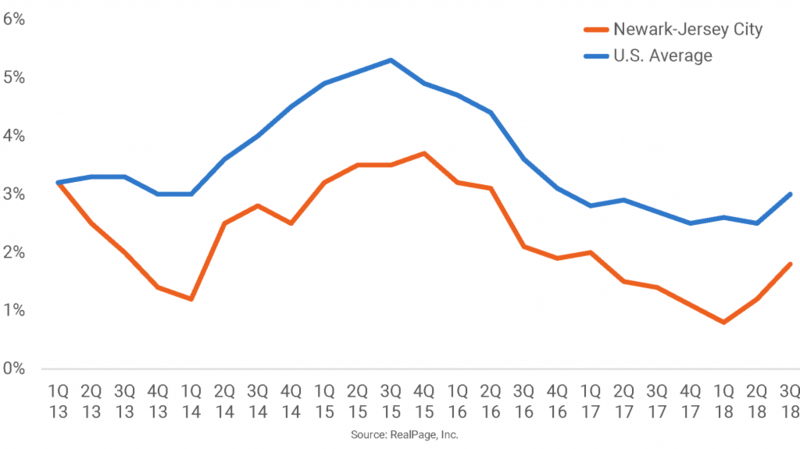 Prices for new-resident leases in Northern New Jersey climbed just 1.2% from 3rd quarter 2017 to 3rd quarter 2018, compared to U.S. annual rent growth of 3.0%. Viewed over the long term, rent growth in Newark-Jersey City has tended to more closely align with the national standard. Influencing the more modest rent increases seen of late in Newark-Jersey City, the market’s apartment delivery volume is running above historical levels. Completions have averaged about 6,300 units annually since early 2013, with peak deliveries for the cycle to date occurring right now. Annual new supply as of 2018’s 3rd quarter totaled 8,590 units. Greg Willett, chief economist of RealPage, Inc., facilitates the alignment of the firm’s technology and analytics solutions with rental housing sector needs and opportunities. He is well versed on macro and micro rental housing market fundamentals and activity: nationwide, by metro and in individual neighborhoods. Greg is active in industry organizations such as the National Multifamily Housing Council, the Urban Land Institute and the National Apartment Association.